We love hearing paddlers wanting to take their furry pals out in the open water! Taking your dog out on a stand up paddle board can be a great adventure for the both of you. But first, we need to find the right paddle board for the both of you. Ideally, one that can support the additional weight of your pet, stability for balance, and has a no-slip deck for better grip. In this guide, we will look at the top 7 best paddle boards for dogs and what makes them suitable for paddling with your pup. Inflatables Paddle Boards for Dogs or Not? There are good arguments on both sides of this question. In the end, it rests entirely on preferences and experiences. Let’s take a closer look at both sides of what makes inflatable a great choice and why you would prefer a hardboard instead. Inflatables are durable and will bounce off stuff: This is especially important for those going river paddling. The rough and demanding terrain will need all the durability and bounce your inflatable can offer. They are easy to transport: The lightweight nature of PVC material and hollow interior means being able to take your paddle board to all bodies of water by hand or strapped over your shoulders and back. They weigh next to nothing compared to solid boards, and can be deflated for carrying and re-inflated when it’s time for paddling. They are convenient for storage and to maintain: The inflatable boards can be deflated and rolled up into a carry travel bag. Most inflatables come with a backpack, so storage in a dry place, ready for transporting, is easy to do. They also don’t require much attention for maintenance. If a puncture appears, a repair kit can take care of it. Otherwise, it’s good for paddling. Standing for your dog is a lot easier on an inflatable than a hard board: PVC is a material that is not only highly durable for rocks or sea beds, but can also survive well against dog claws. Inflatables back in the 90’s may not have been tough, but PVC has gone a long way in terms of quality. Super affordable: Compared to hard boards, inflatables are extremely cheap. You can easily find boards that are up to 50% less than foam or epoxy boards. Puncture of the board and the aftermath on the water is always a concern: Despite PVC materials being the best they can be to date, it doesn’t guarantee that a puncture will not happen. Dealing with the aftermath sinking should be part of your gameplan whenever you paddleboard with an inflatable. It can also be unfortunate that punctures are so bad, they render the paddle boards unusable. Inflatables don’t perform as well as solid, rigid boards: When we talk about performance we are talking about traveling through the water efficiently with the least amount of paddling effort and the ability to track as straight as possible. Doesn’t handle well on windy days or on choppy water: Inflatables don’t have a lot of weight, so are easily subjected to the direction of the wind and water. Your pet might not be comfortable on a paddle board he/she struggles to balance on. Whichever you go with, all types of boards including inflatables work excellently for you and your pup. The ISLE Versa Epoxy is a thermal molded paddle board using epoxy resin for a lightweight and durable design. It is 10’5″ long, 32″ wide, and 4.5″ thick. 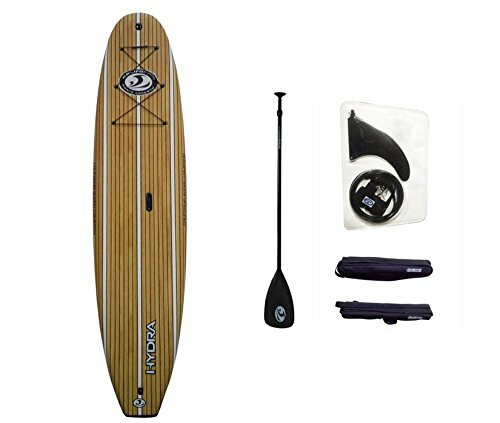 The padle board also comes with an adjustable carbon shaft plastic blade paddle, a removable center blade, and coiled leash. The front part of the board also has a bungeed compartment for storing small bags. It also supports a weight capacity of up to 275 pounds, which works out great for a rider and a furry pal. We like this paddle board because it has a large no-slip deck pad that goes all the way to the tail for much need space. The deck pad is non-abrasive and easy on the skin so you can paddle for long hours while standing, sitting, or laying down on your board. The outer shell is also durable and great against any pet claws. and it handles great in the water. Durable outer shell, speed finish less weight and looks amazing. Most inflatable paddle boards are 4-6″ thick, but this 8″ thickness is massive. The extra thickness provide greater inflating capacity handy for improved buoyancy and load support. It’s no wonder the Driftsun Orka can support up to 3 adult passengers! The paddle board also has a significantly large traction pad on the deck that is great for your curious pets to maneuver on. For paddlers who want to bring two or more dogs, this paddle board is perfect for you. The multiple D-rings along the side also means you can carry more things on board, including coolers and large bags for, say, a fishing trip. And being able to attach kayak chairs means being able to make your paddle board more comfortable for those long hours in the open water. It will take time to inflate! The Driftsun Balance is an 11” long, 34” wide, and 6” thick paddle board designed for yoga enthusiasts. The board has a great surface area with an even better traction pad to give riders much needed grip when paddling or balancing in choppy waters. 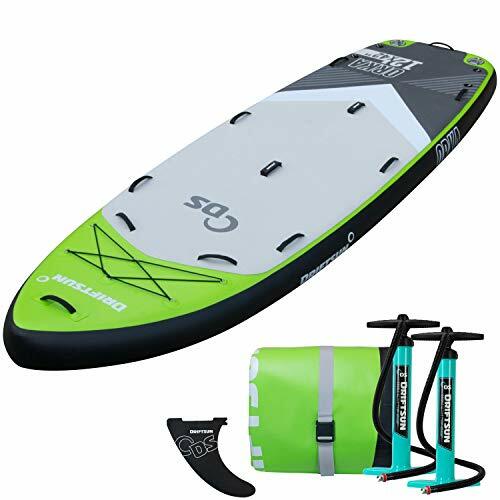 The paddle board includes everything essential a paddler needs, including a travel carry backpack with wheels, an adjustable aluminum paddle, a coiled ankle leash, a removable center fin, and a manual pump to inflate the paddle board. Thanks to the large design of this paddle board, it provides stability greater than most inflatable paddle boards. Although it is still susceptible to waves and choppy water as an inflatable board, it does much better to stay afloat. The large deck space and traction pad is also great for your pets to walk around on, especially for the puppies that can’t sit still! The carry backpack is also great for storage and you can roll it on the floor if it‘s too heavy. The CBC Hydra is a soft top foam board with a maximum weight capacity of 300 pounds. It measures 10’6″ long by 32″ wide and 5″ thick. The insides use high density EPS, heat layered and laminated with wood stringers and waterproof resin. The Hydra also comes with an adjustable paddle, SUP leash, a removable center fin, camera mount, and a padded car roof rack. The paddle board deck doesn’t appear to have any special deck traction pad, so you might need wax or your own pad if you want extra no-slip guarantee. However, other owners have commented how the top of the board feels pore-like and have had no problems with slipping, including with their pet dogs. The paddle board handles well, looks cool, and soft enough to lie on top. Paddlers sensitive to hard surfaces will appreciate this soft top foam paddle board. 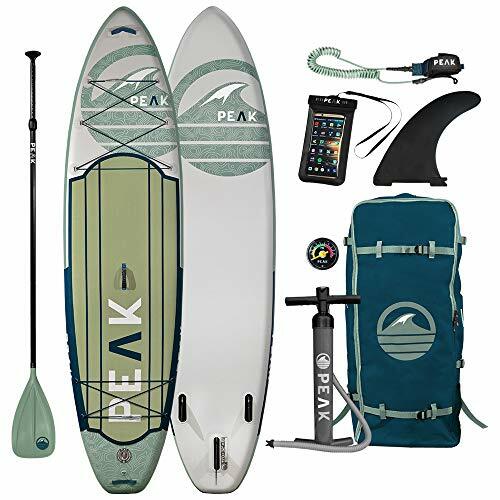 The Peak Expedition is an inflatable board designed for long distance touring and cargo. It measures at 11′ long at 32″ wide with a thickness of 6″. It supports up to 350 pounds. 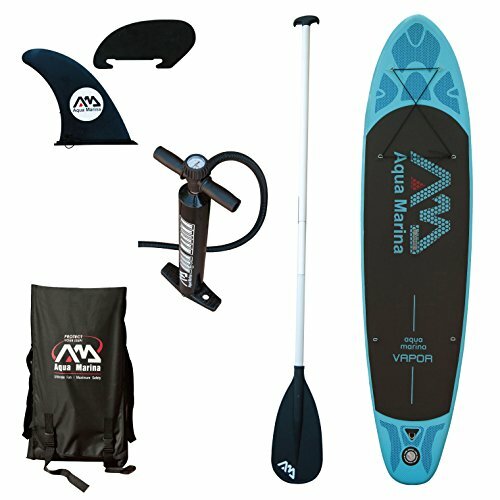 The paddle board package includes a great look shoulder strap carry backpack for storage and transporting your board, an adjustable alloy paddle with nylon blade that floats on water, 10′ coiled ankle leash, a manual pump with a pressure gauge, 9-inch removable center fin, and a mini-bonus waterproof smartphone carry case. The board also comes with multiple D-rings and two bungeed compartment in the front and back for carry-ons. First off, this board is bigger than most paddle boards. Although it’s not as large as the Driftsun Orka (we’re not sure what other paddle boards are as big), the Peak Expedition is big enough to carry a pet or two and small enough to paddle without too much effort. It also designs the surface of the deck with little dimples throughout the board to provide grip. Dogs like the softer surface of inflatables better, and this paddle board does just that. Although you can expect some claw marks over time, the Peak Expedition material is tough enough to withstand the claws. The Aqua Marina is an inflatable paddle board built with a lot of deck traction padding. It’s dimensions are 10’10” in length, 30″ in width, and 4″ thick. Although it may not be as wide or as thick as other inflatables, it has maximum capacity of 250 pounds, and is much cheaper than other choices. 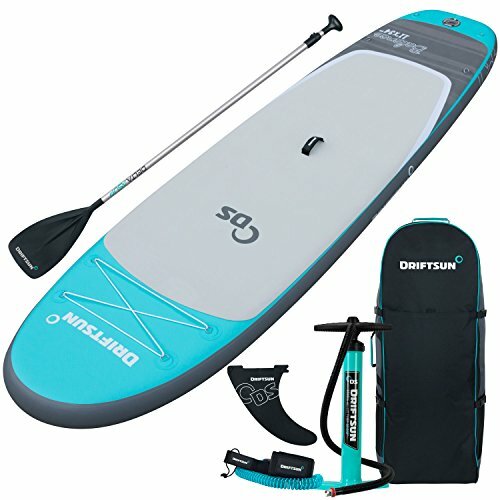 It also includes accessories like a paddle, removable center fin, a manual pump with a pressure gauge, and a shoulder strap carry bag for storage and transporting the board. 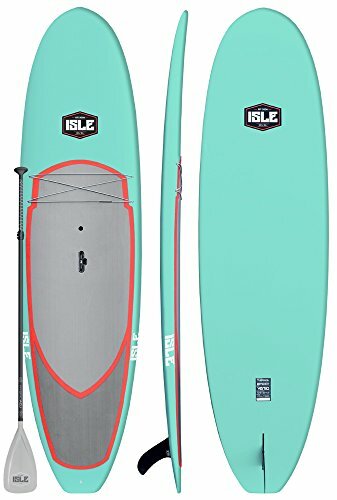 The paddle board is very affordable entry-level paddle board for beginner paddlers. It’s deck surface also has a lot of traction and grip from the head to tail. This is great for dogs or paddlers who slip when they paddle. It also makes for a great board for yoga paddleboarding. 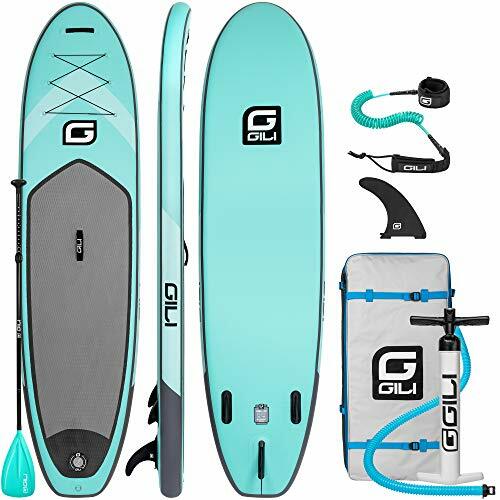 Last, but not least, the Gili is a sizeable inflatable board that is affordable and budget friendly. It measures at 10’6″ long by 31″ wide and 6″ thick. It comes in a complete bundle including an adjustable paddle, 10′ coiled ankle leash, a manual pump with a gauge, a removable snap-in center fin, and a good-looking travel carry backpack. The board also has a large front-end bungee storage compartment for use. This board supports a maximum weight of up to 275 pounds. One thing we like about this board is the cost. It’s not over-the-top expensive, so beginners interested in leisure fun can consider this board. It’s also thick enough to provide more buoyancy than other lower end boards around 4-5″ instead of the Gili’s 6″ thickness. The paddle board has a large traction pad so your dogs won’t have trouble standing around on it. You can place your own traction pad in the front so your dog can stand and sit without slipping. Our furry friends deserve the absolute best. When you are looking for what paddle board to buy, there is a few criteria to keep in mind. What Does A Paddle Board for Dogs Need? On average, paddle boards have a buoyancy level that supports up to 275 pounds. Boards that are smaller than the average (10′ long by 30″ wide and 6″ thick), can have less load support. Watch out for this especially if you have a larger and heavier dog breed weighing over 100 pounds, like a mastiff or rottweiler. Most paddle boards have traction pads for dog paws so they can stand better. Although most dogs can stand and sit with balance on any paddle boards, inflatable or solid, a large unspoken factor including the water you are in. Some paddle boards also lack traction pads in the front of the board, which is where most dogs are told to sit. If a paddle board is slippery and you need more grip for your dog, self-adhesive traction pads for dogs are available. For example, the Punt Surf Ripper Traction Pad is one of the popular ones available. It comes in many colors, too. You can use it for both the front or back end of your paddle board. The two measurements we want to look out for is the length and width. Although the average 10′ long by 30″ wide board has a lot of space, more is better. This is important for dogs who wander around on the deck, for paddlers who want to bring carry-ons, and for more activity space (like for bathing in the sun!). Most paddlers discourage their dogs to hop off their paddle board and swim when they are far from the shoreline for safety reasons. Even if your dog can swim, it’s important for your safety and theirs to wear a life jacket. Buoyancy: Even if your pet knows how to swim, they might find themselves unable to because of exhaustion, panic, or other physical challenges in place such as climbing back onto the board. The added buoyancy makes it easier for them to stay float and gives you a chance to rescue them. Visibility: On the off chance you lose track of your dog, a bright color life vest in a sea of blue can help you spot your dog quickly and easily. Assistance: When your pet falls off the paddle board, they might have trouble climbing back on. With a life jacket, you can assist your pet better by grabbing a handle on their vest to pull them back onto the board. One of the best life vest we found for dogs is the Outward Hound Granby. It’s a popular, market-tested, adjustable life jacket that fits both small and large dogs. It has foam panels on the side for added buoyancy and a secure neck float to keep your dog’s head above water in case of emergencies. The Granby also has a dual rescue handle making it easy for you to pull your dog out of the water. The life vest also doesn’t get in the way of your dog’s swimming as it’s designed to provide buoyancy from the side of the body, away from the front and hind legs. Paddling with your pup is both a fun and amazing experience. The both of you can share an awesome adventure out in the open water, and you won’t have to feel bad for leaving them behind. Choosing the right paddle board for your dog and yourself doesn’t have to be difficult, so we hope in this buyer’s guide helps you choose a suitable one for the great times ahead!